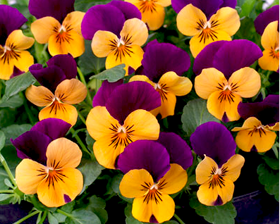 Small compact plants produce masses of gorgeous flowers in this unique colour combination of violet and orange. Looks just as stunning in autumn, spring or summer containers. Sow February to September. Sow seed on the surface of lightly firmed, moist seed compost in pots or trays. Cover with a very fine sprinkling of compost or vermiculite. Seal container inside a polythene bag and keep at a temperature of between 15-20C. Germination will usually take 14-21 days. Take care not to provide too high a temperature, as this can prevent germination.